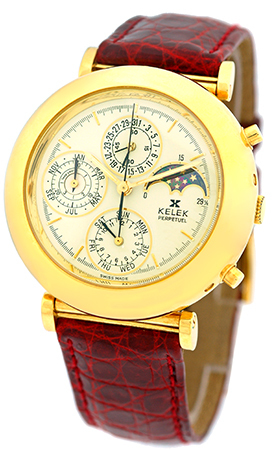 Gent's 18K Yellow Gold Kelek "Perpetual Calendar" Chronograph Strapwatch. Ivory Dial with Gold Baton Markers, Subsidiary Second Hand. 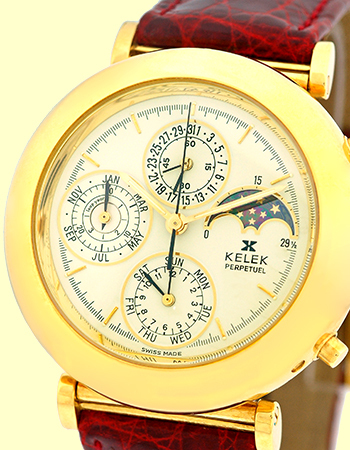 Subsidiary Dials for Day, Date, Month, Moon Phase, Leap Year Indicator, and Chronograph Functions. 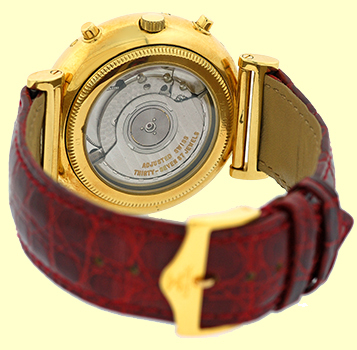 Highest Quality Kelek Burgundy Alligator Strap attached to the Gold Plated Kelek Tang Buckle. 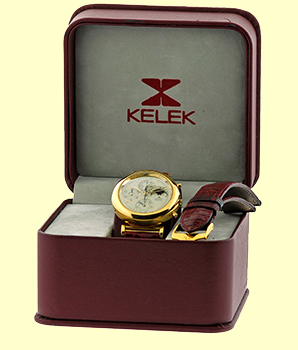 Certified Pre-Owned, Like New Condition with Kelek Box, Warranty Card, Extra Alligator Strap and Buckle, and complete with Capetown's Lifetime Warranty! !